The Night Lights Are On! When we were coming up with the call outs for the cover for this issue I thought I would be writing about how the Harbor is “heating up” for the summer, however, after I saw the new addition of the “overhead” lighting on Fleet Street, I changed my mind! 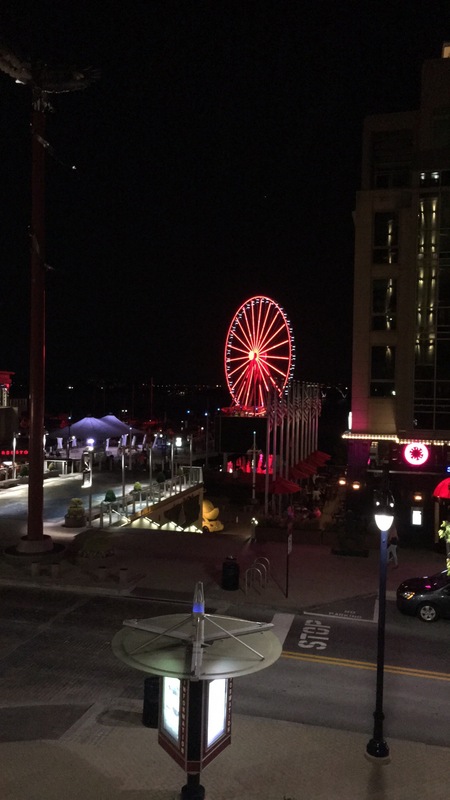 Night time here in National Harbor is special, especially when the weather is beautiful, and is my favorite time to roam around and take in the sites. The Capital Wheel and the Carousel are no doubt the largest “light” attractions here. I love the fact that Derek and his team at Icon Attractions program the wheel so that it lights up in colors that support local happenings. They are burgundy and gold when the Redskins play, purple and black when the Ravens play, have a curly W when the Nationals are on top of their game and right now it is “Rockin’ the Red” for the Capitals! I swear those red lights have been a good luck charm for our fickle hockey team. 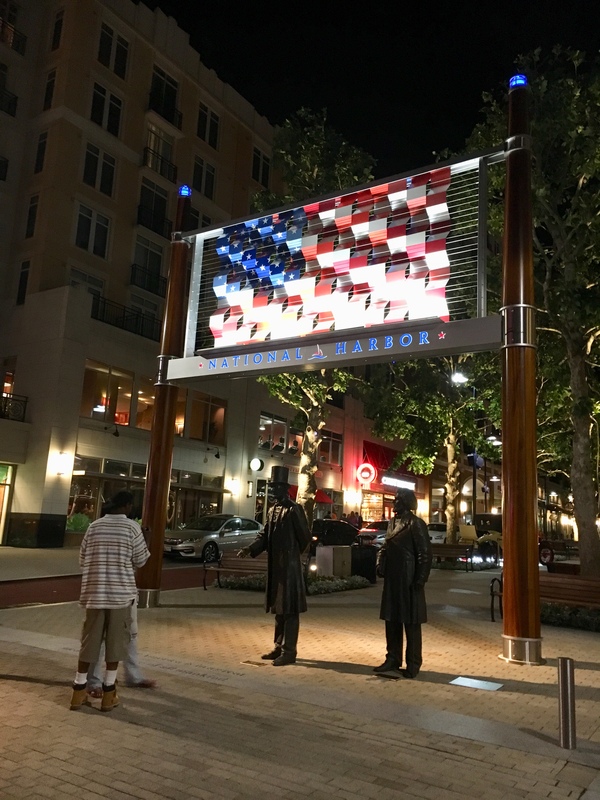 The American flag that adorns the first block of American Way is impressive in both daylight and night. The lights that adorn the trees in the first block of American Way, however, are in need of some tender loving care. When I first moved over here from the Del Ray neighborhood of Alexandria, the multi-colored box shaped lights were spectacular. They are now in need of replacement so hopefully that will take place soon. Peterson Companies is pretty particular about this space on the Maryland side of the Potomac so I am positive the situation will be rectified soon. Now for the piece de resistance – the new “overhead” lights in the one hundred block of Fleet Street! While walking to Irish Whisper one evening a few weeks ago I noticed a crew of guys in trucks with cranes hanging what appeared to be netting between the buildings on both sides of the street. I knew that there was a big block party sponsored by some huge corporation coming up – they reserve the whole first block and the restaurants that occupy it – that takes place annually so I just thought it was some more “over the top” decorating taking place. These people have big money!! 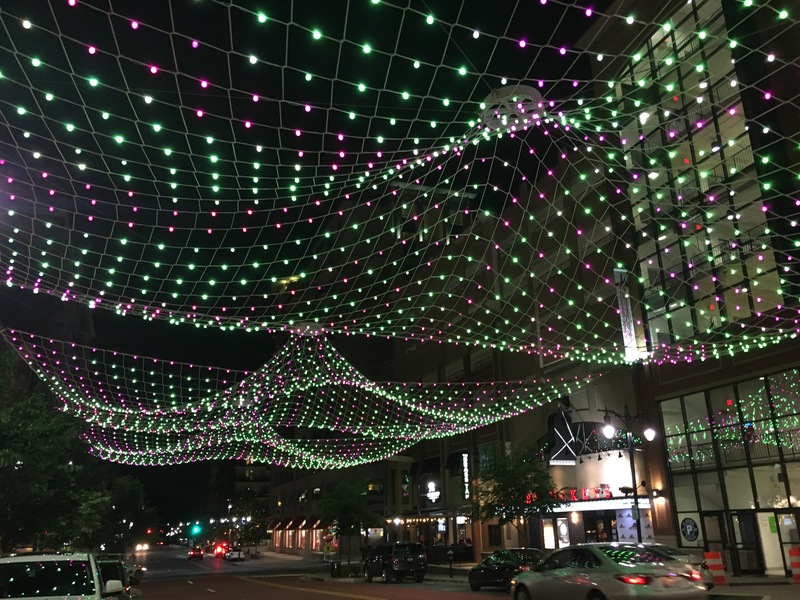 I was, however, pleasantly surprised to find out that it was a netting of lights that are a permanent fixture on the block. I can’t explain how good those dumb lights make me feel! They give the street a festive feel – sort of like parts of the downtown Vegas strip only on a much smaller scale. Lots of stuff going on here in the Harbor now that summer is creeping up on us. After these last couple of weeks, I am hoping the dumb rain stays on hold so you can enjoy the free fitness classes on the plaza, the movies and Sunset Concert series as well as all of the antics that take place on Friday nights.